Buster “Rant” Casey just may be the most efficient serial killer of our time. A high school rebel, Rant Casey escapes from his small town home for the big city where he becomes the leader of an urban demolition derby called Party Crashing. Rant Casey will die a spectacular highway death, after which his friends gather the testimony needed to build an oral history of his short, violent life. With hilarity, horror, and blazing insight, Rant is a mind-bending vision of the future, as only Chuck Palahniuk could ever imagine. Rant has the usual elements you’d expect from Palahniuk—gross, dark, disturbing, highly un-PC stuff. I thought the story in general was creative, and I enjoyed the high-octane, fast-paced narrative by and large. The story is told as a retrospective in interview snippets with shifting character perspectives and recollections that took some getting used to, but once I did I breezed through this one, and all the parts that seemed unrelated click as the story progresses. Palahniuk is inventive but may try a bit too hard for shock value, and there are SO many elements it felt a bit “jack of all trades, master of none” to me… hard to explain without spoilers. I’ll just say that Rant does follow the Palahniuk formula—edgy, enigmatic character who rejects societal norms, weirdness, plot twists. I gave Rant a solid 3 stars on Goodreads, which is “liked it.” I don’t regret reading it all the way through, and I loved discussing it with my husband! But I can’t say this is a favorite, or even one of Palahniuk’s best. I probably liked it better because I went in without thinking too hard about the storyline. I liked it for what it is—a fun, weird, fast-paced read. Read from January 9 to 11, 2015. This entry was posted in books and tagged contemporary literature, dystopia, horror, humor, science fiction by kristin @ my little heart melodies. Bookmark the permalink. 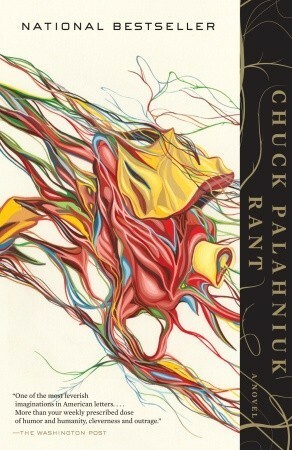 I quite enjoyed Rant too, although I think Palahniuk’s books are suffering from the law of diminishing returns. That totally makes sense. I was so wowed by him with the first couple books I read, and now they just don’t thrill me the same way.